Accommodation is lodging in beautiful and historical lodges. You will be followed by a local guide and a local chef to maximize your experience. Day 2: Victoria Falls and sunset Cruise. Breakfast and guided tour of the Victoria Falls from the Zambian side. Return to Livingstone for lunch (not included) and afternoon Sunset Cruise on the Zambezi River. Own arrangements for dinner and night at the lodge. Hwange National Park is the largest National Park in Zimbabwe. The park has an extension of almost 15.000 km² an arid land that comprises of both the Kalahari sands and teak forest areas, sustaining one of the largest animal populations of all Africa. 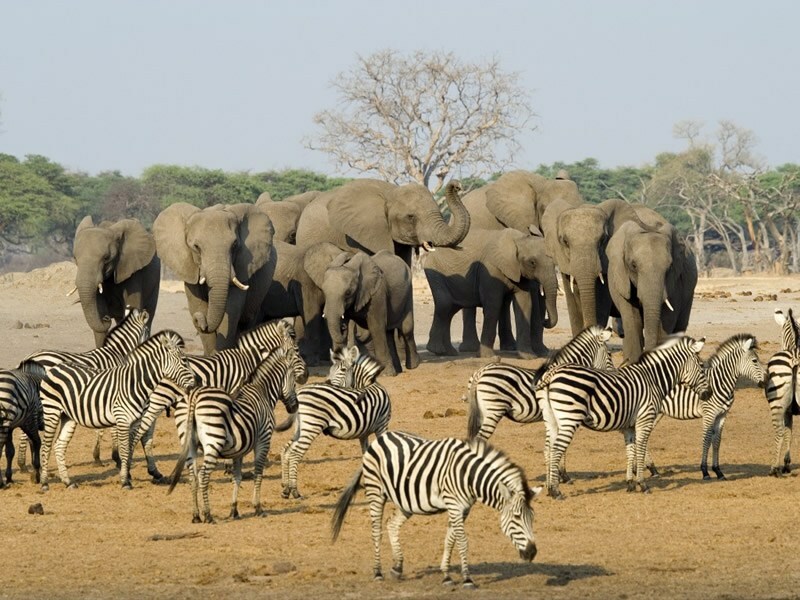 the park shelters 30.000 elephants, 15.000 buffaloes, giraffes, zebras, and a multitude of antelopes species. Recently, both white and black rhinos have been reintroduced, after they were extinct by poachers. the more frequent predators species include lions, leopards, cheetahs, hyenas, wild dogs and servals. the Park also also a count of over 400 species of birds. 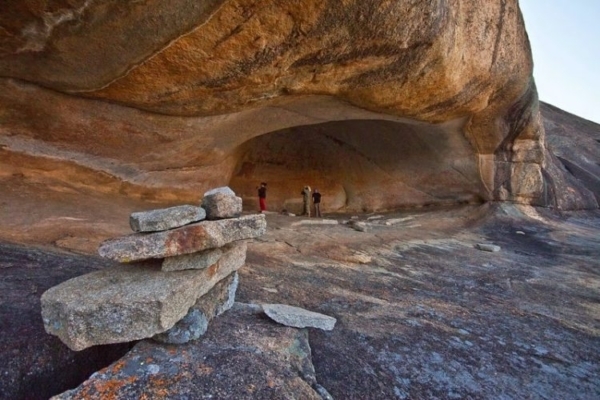 All tourism is concentrated in the northern sector of the park, while the rest of the space is left wild and maintained as a wilderness area. Sunrise breakfast and border crossing to Zimbabwe across the Victoria Bridge. Tour of the Falls from the Zimbabwean side, followed by departure to Hwange (200km of tarmac road, approximately 2,5 to 3 hours). 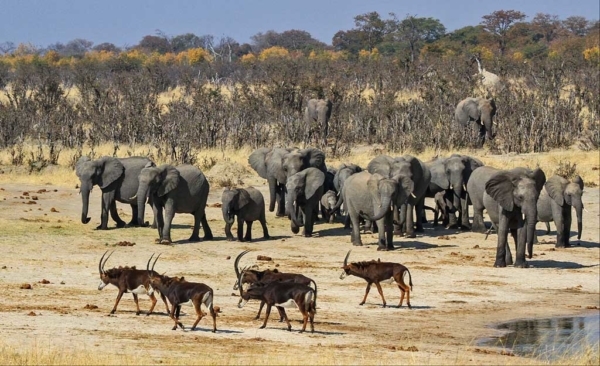 Arrival and visit the Hwange Painted Dogs Centre, where you will learn many interesting facts on African wild dogs and their struggle to survive. The Wild dogs centre also acts as a rehabilitation for wounded wild dogs, and participants will be able to observe these beautiful animals before they will be released in the wilderness. After the visit, proceed to Gwango Lodge and accommodation on full board + selected activities. Night drive in the GMA that surrounds the national park, dinner and night at the lodge. 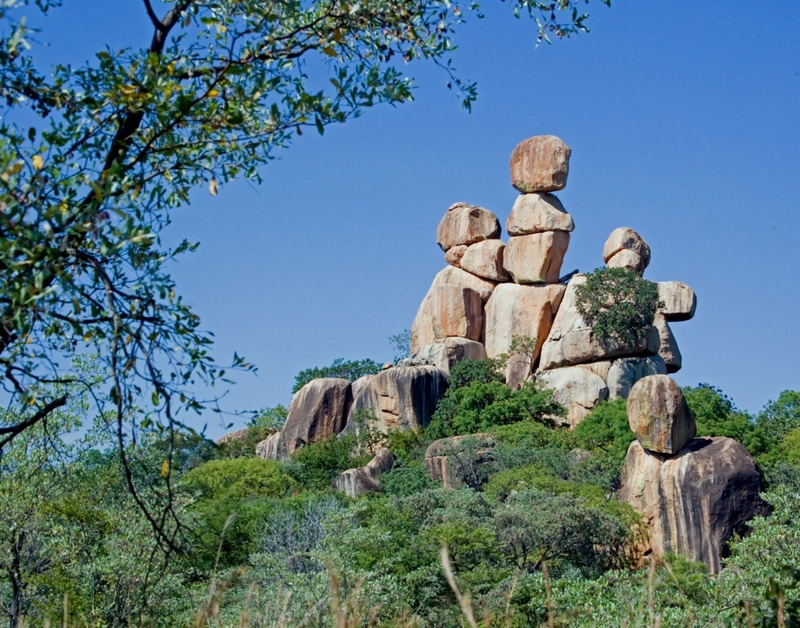 the Matopo Hills are granite formations that more than 2000 years ago sheltered early populations of San (bushmen). 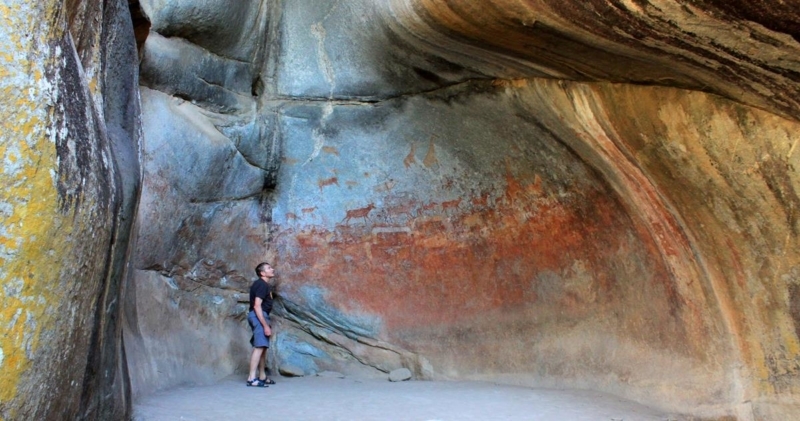 These people left intricate and prolific rock paintings all over the area that are now protected by UNESCO. 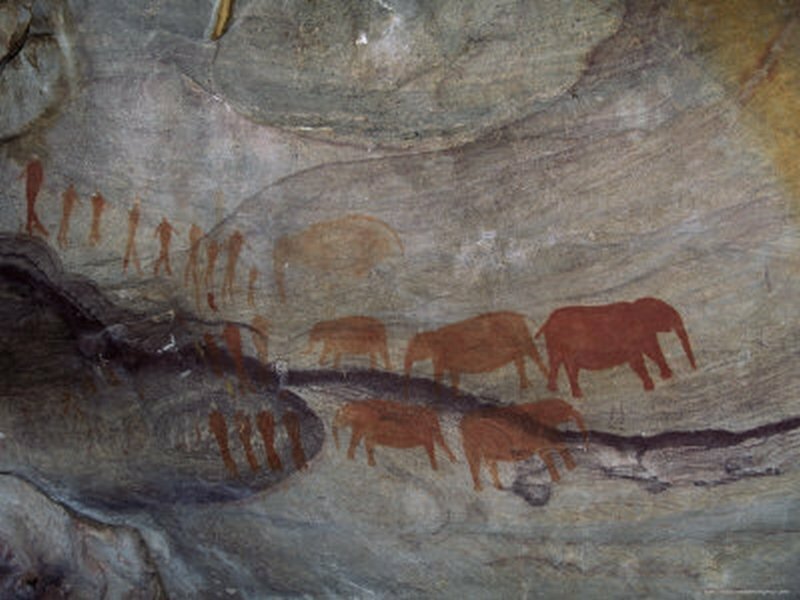 The Matopo Hills National Park also hosts a population of white and black rhinos as well as the grave or the famous Sir Cecil Rhodes. Sunrise breakfast and free morning, available for additional activities of your choice at National Park (available activities to chose from include Horse-back riding safari, game drive, walking safari, local visits and tours, etc.). At the end, Brunch and departure for Matopo Hills National Park, where we will reach at sunset. Check in at at Matopo Hills Farmhouse, a farm with more than a century-long history and currently devoted to wildlife protection and reproduction. Within the farm live numerous herbivores such as Zebras, giraffes, antelopes, warthogs and predators such as leopards and caracals. Also, exploring the farm visitors can come across rock paintings and other traces of ancient San civilizations, such as iron smouldering pits and clay ovens. dated more than 8000 years ago. To spend a couple of nights at Matopo Famrhouse is an unforgettable experience that will cast you back into the history of this land. Check in at the lodge on a full-board basis + selected activities. Breakfast at the lodge, followed by a full-day guided tour of the Matopo hills National Park, hopping on and off the safari vehicle as you experience the park both on foot and driving. During this incredible day-long adventure, you will track black and white Rhinos on foot, enjoy game-driving, trek along ancient bushmen routes in the granite hills to discover rock painting and learn about lifestyle and medicinal plants, and visit the National monuments of Cecil Rhodes’ tombstone and the memorial of the fallen soldiers during the colonial wars (“the view of the world” heritage site). Lunch will be at a scenic point inside the park. Return to the lodge by sunset, dinner and night lodging. Breakfast and free morning, available for additional activities of your choice at National Park or to explore the Farmhouse property. Lunch not included and departure for Masvingo, where we will reach in the afternoon (3,5 hours transfer). Check in at an historical lodge (Norma Jeans Lodge), overlooking the Kyle lake, where the owner (Norma Jean) will be available to welcome us and tell us about the history of the Farm and her family. The Farmhouse is surrounded by stunning gardens rich in local plants and flowers, that provide shelter for countless birds. Dinner at the lodge and night lodging. 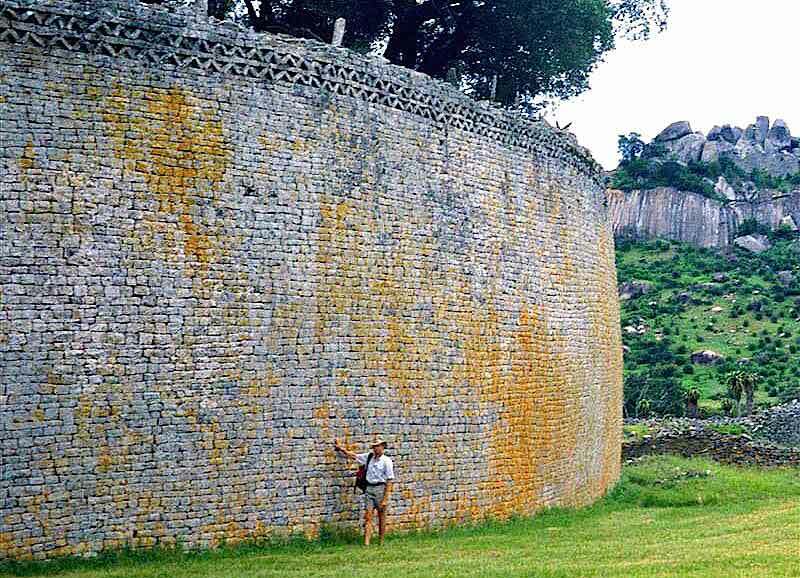 Great Zimbabwe is the name of an archaeological site containing the ruins of a vast pre-colonial city, built mainly with granite blocks and protected by a massive wall fence. The city is one of the architectural masterpieces of human history, alongside with the great Pyramids of Egypt, Stonehenge and Machu Picchu. The city was already abandoned when the first Portuguese explorers reached the area so most information regarding the building, history and reasons for abandoning this city are still unknown and controversial. It’s commonly thoughts that the city was the largest city of a Shona empire, known as Monomotapa, and that it was controlling a large are extending between modern Zimbabwe and Mozambique. 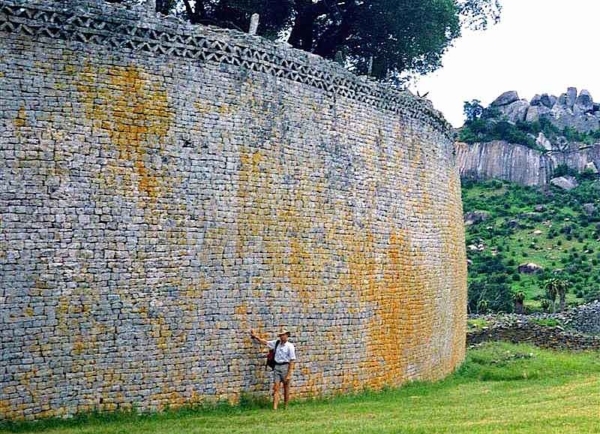 the Great Zimbabwe ruins are the most important national monument of Zimbabwe and the site was declared Patrimony of Human Kind by UNESCO in 1986. 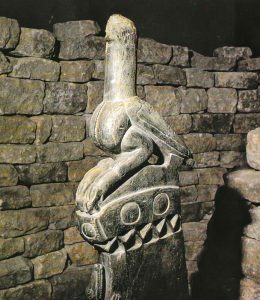 The bird that represents the current symbol of Zimbabwe is taken by a statue found in these ruins. 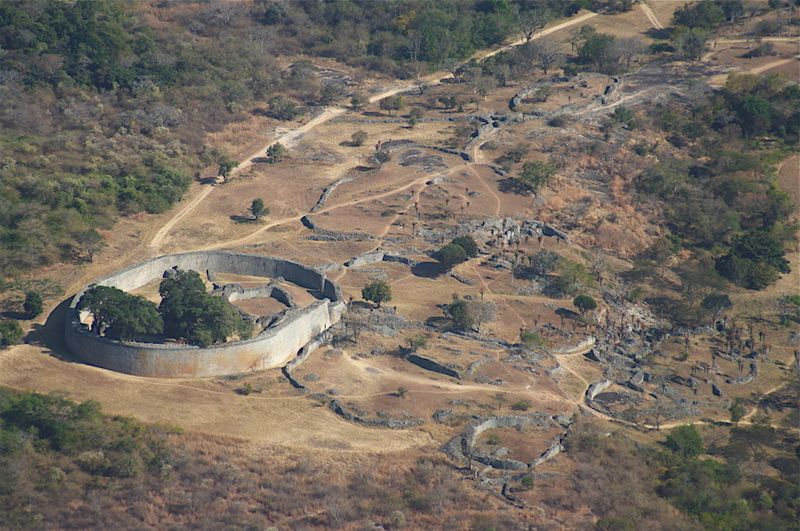 The morning will be entirely dedicated to the exploration of the Great Zimbabwe ruins and learning the history of the region. Lunch not included and afternoon visit of the Mutirikwi dam. Breakfast at the lodge, and free morning for optional activities in the area, such as game-drive in the close-by national park, trekking through the gardens to the Kyle lake, historical tour of the city of Masvingo, including the famous Italian chapel that provided shelter for WWI refugees, etc. Lunch not included and afternoon departure for a 250km transfer to reach Harare, the Capitol city of Zimbabwe. Check-in at a lodge and dinner in one of the many restaurants of the city. Morning dedicated to relaxing and preparation of luggage. Based on your flight schedule, you will be brought to Harare International Airport. End of the tour.